Imagine you wanted to visit a new restaurant on the opposite side of town. Although it’s in an area of the city you haven’t visited before, you understand its location from the map. Getting there should be completely doable with some trial and error, and maybe asking for the way once of twice. No biggie. Now imagine when you leave the house, somebody blindfolded you, spun you around a few times and then wished you good luck before sending you off to find said restaurant. You’re left groping blindly through the streets trying to get to your destination, never knowing if you are even going the right direction. It is entirely possible you might get there at the end, but it sure would be easier if you could use your eyes. Running a website without proper analytics is just like running around with a blindfold on. No matter what your goal or destination is, whether it’s selling more products, attracting more readers, increasing sign-ups, or anything else—analytics can tell you whether you are actually getting there. It’s what lets you take off the blindfold and see if you’re even in the right street. Because this kind of feedback is so important, it’s no wonder there are many people who obsessively check their traffic, bounce rate, and other website stats. It is also the reason why there’s such a variety host of tools available to cover all the needs for website analysis. Though Google Analytics is probably the most well-known of the bunch, it’s not the only one and not even necessarily the best. The field of web analytics is broken down into two basic camps. On the one hand there are the proponents of quantitative analysis, who have a numbers-based approach. Think of page views, unique visits, etc.. On the other hand there are advocates who stress the importance of qualitative data and who like to look closer at visitor behavior. In this article, I’ll look at both sides of the field, and review some of the available tools as well as their pros and cons. The main reason why the use of Google Analytics is so widespread is because it’s free and offers a wide range of features. Another reason is that since most of us are optimizing our websites for the search engine giant, it just makes sense to go with their official tools. 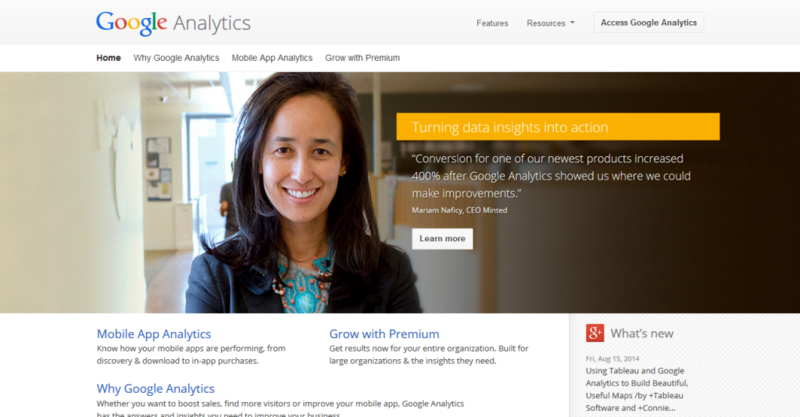 To use Google Analytics, you will need a Google account. You’ll also need to install a code snippet to your WordPress site. This process can be made easier by using a plugin such as Yoast’s Google Analytics for WordPress. There are plenty of options available to perform an in-depth analysis of your site: Not only do you learn about overall visitors, but you also obtain data on unique pageviews, visitor behavior, time they spent on your website, bounce rate, and more. The service also comes with content experiments for A/B split testing. Jetpack is a popular plugin collection by the makers of WordPress.com and contains a wide range of tools—one of which is analytics for WordPress sites. The plugin promises visitor tracking for your website without extra strain on your server, in times where loading speed is part of SEO. This is good news. The plugin’s setup is quite straightforward: install Jetpack to your site, activate, and link it to your WordPress.com account (don’t worry if you don’t have one, it’s free). Once the connection is established, WordPress will quickly start showing information about your site’s traffic. Because Jetpack is part of the WordPress dashboard, there’s no need to visit another site. You get an overview of your daily visitor numbers right in the welcome screen and the WordPress admin bar. Accessing the details reveals top-performing posts and pages, referrers, search engine terms, and clicks on external links. What is missing, however, is the number of unique visitors. While Jetpack does not offer the possibility for in-depth analysis as other services, it is a great tool for day-to-day tracking. It shows real-time analytics to help identify your site’s most popular content of the day, and can therefore supply a good momentary overview of your site. Using it to keep track of multiple sites, however, is a hassle as it requires you to sign in to each of them separately. 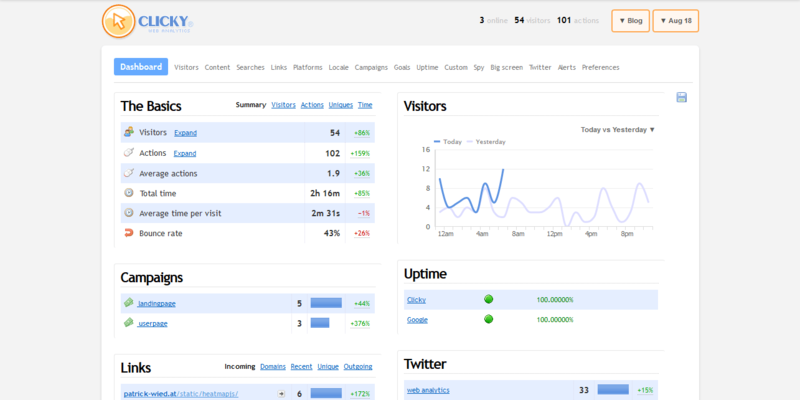 Clicky is another analytics tool suitable for WordPress. It offers real-time data, individual visitor tracking, and can be extended with premium features. Similar to Google Analytics, Clicky requires a tracking code in order to work. Thankfully there are plugins available such as Clicky by Yoast and Clicky Analytics, which also supports WPMU. One of the main points in favor of Clicky is its ease of use. The interface is very straightforward and intuitive, especially when compared with the alternative from Google. All important data is delivered to the dashboard from where you can then drill down to the details. Since the service doesn’t use any flash, all data can be conveniently viewed from mobile devices. If that isn’t enough, there are also mobile apps available, which make tracking on the go even easier. 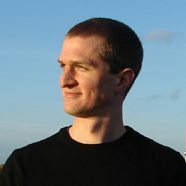 Clicky is free for basic usage for one website. More advanced features such as goal tracking, heatmaps, and split testing require a premium account starting at $9.99 per month. A discount for yearly payments is available. Price: Free for one website and 3,000 page views per day. Premium accounts from $9.99/month. Next on the list is Piwik. The remarkable thing about this solution is that it is completely open source. 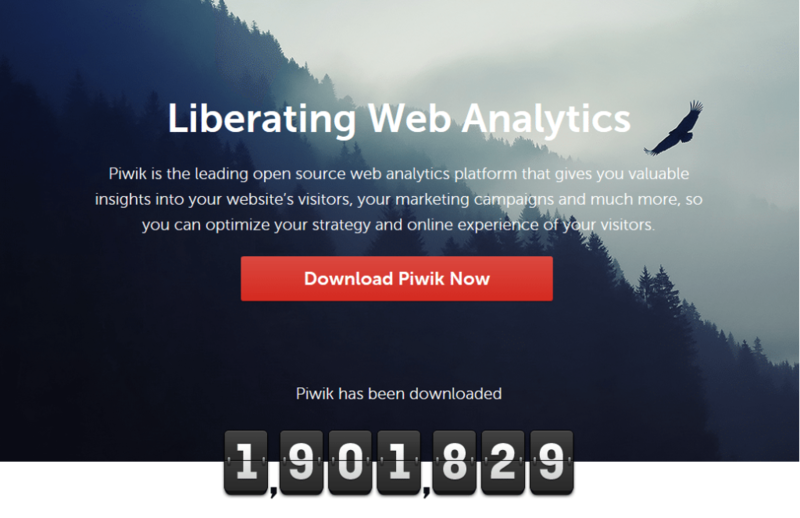 Piwik web analytics has a GPL license and the non-cloud version costs absolutely nothing. Oh yeah and your analytics data remains your own. One big difference to most other services, however, is that Piwik’s installation is not as easy as adding a code snippet to your website. Unless you choose Piwik Cloud, you will be required to install the software on your own server. Fortunately it promises a 5-minute install, which WordPress users should be able to deal with. A Piwik WordPress plugin is also available. What’s great about this service is that its makers respond to bugs reported by users quickly, and are completely transparent about fixing them. Closed bug tickets for every new version can be viewed in the changelog. There’s also a large community surrounding this service where new users can find help and support. Price: Free if hosted on your own server. Premium cloud service with 30-day free trial available. The analytics tool Reinvigorate aims to deliver the most important data in the simplest way possible. 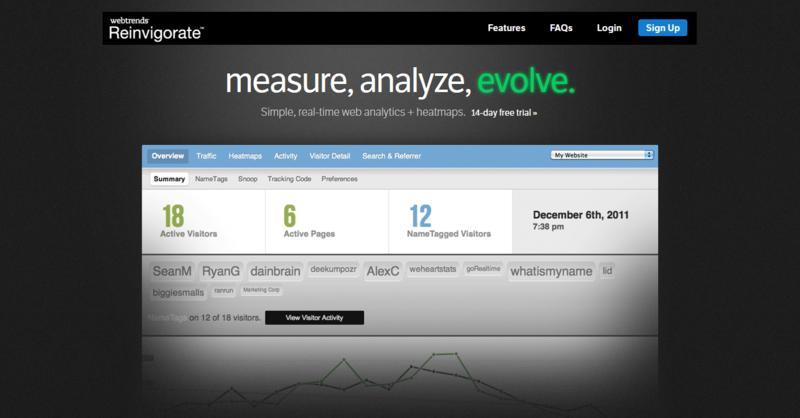 It offers real-time visitor tracking, heatmaps, and a tool to deliver the data right to your desktop. Reinvigorate is set up with the usual tracking code, which is delivered via CDN to improve load times. A plugin makes installation easy for WordPress sites. The service allegedly comes with a free version that offers basic information such as traffic reports, referral traffic, visit length, and bounce rates. However, I could find no sign-up for the free edition. Paid accounts deliver much more data on each individual visitor, down to browser version and IP address, as well as four different heatmaps. Price: Plans start at $10/month for three websites and 500,000 monthly visitors. All plans come with a 14-day free trial. You can integrate KISSmetrics easily with WordPress by installing their plugin and entering your API key. Choose which events to track and the plugin will take care of the rest. The great thing about this service is that it connects all your data to actual people. It tracks users across browsers, devices, and time. No matter if someone leaves your site and only comes back a year later, you will still know who they are and how they found you. The service also lets you track people along sales funnels to figure out where you lose them and what needs to be optimized accordingly. A big downside of KISSmetrics, however, is the price. Most small businesses and individuals will hardly be able to shell out $150/month for an analytics solution. Therefore this service might be more suitable for bigger enterprises. Price: Starter plan from $150/month for up to 500,000 monthly events. Mixpanel is another event-based analytics tool. Some people compare it very favorably with KISSmetrics because it offers similar functionality but is much more affordable, since it offers a free account. Connecting WordPress to Mixpanel is not as straightforward as it is with other solutions, because no official plugin exists in the WordPress directory. There is, however, an unofficial one available on Github. 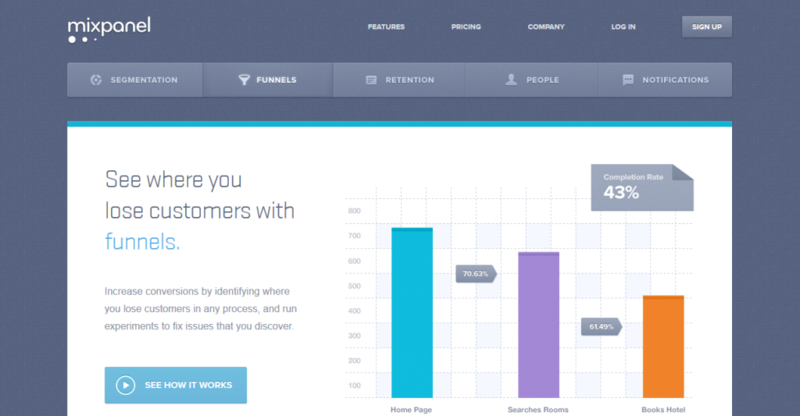 The service allows you to measure what people are doing on your site and how engaged they are. Mixpanel visualizes complex data and provides powerful segmentation options. Price: Free for up to 25,000 data points, paid accounts from $150 per month. Another solid contender for collecting action and behavior-based data points is Foxmetrics. It tracks how visitors interact with your page, such as when they make a purchase, view a page, click a banner, or perform any other action. At the same time, quantitative data such as page views, visits, and bounce rates is also provided in real time. Since Foxmetrics integrates with a wide range of third-party applications—such as Mailchimp and SalesForce—you can track the entire customer life cycle. From first page visit, to login, to opening your email, to making a purchase—everything can be captured. With plans starting at $20/month, the service is also quite affordable, and there are even 14-day trials available. Price: Plans start at $20/month for 100,000 requests. With an approach similar to KISSmetrics, the platform Woopra allows putting together incredibly detailed behavioral profiles of your users. It helps you to quickly collect the data that’s important to you and your business. A plugin for Woopra integration in WordPress is available, but, for lack of data, it is not entirely clear how well it works with the latest WordPress version. 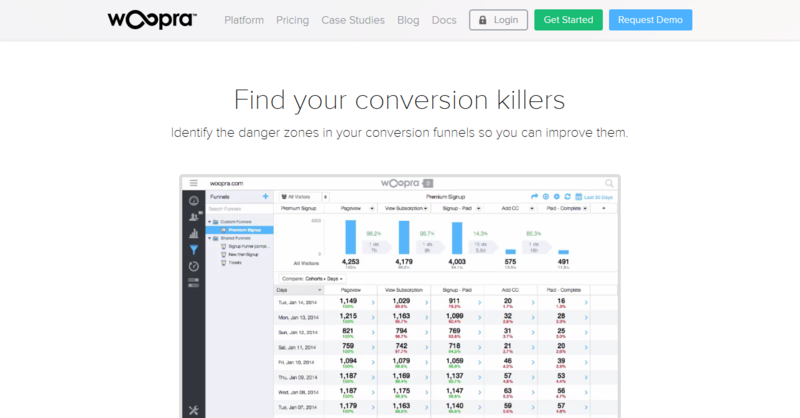 Besides creating a clearer profile of your visitors and their actions, Woopra allows you to discover dead ends inside funnels and track customer retention. Data is delivered in real time and Woopra supports automation such as emailing weekly reports. Price: Free account with limited features available for 30,000 actions per month. Paid accounts from $79.95/month. What is you favorite analytics tool and why? Anything to add to the list? Let us know in the comments.